I love my dotter. Repeat: I LOVE MY DOTTER! So, when I feeling like switching up my nails, it's a go-to option. But sometimes, just having dots is boring. When I add studs and gems, I've always used tweezers to place them, which doesn't really work. When I saw a wand thing-y at Sally's, literally called a Picker Upper, not only did I giggle, I bought the sucker. I think it works with static electricity but really, it doesn't matter. What matters is that the little plastic end is able to pick up a gemstone or stud really easily so you can place it exactly where it needs to go. A very sound six dollar investment. If you work with gems, I totally recommend getting one. Two coats of Renee and then two different sizes of dots with Viola (a dark red even though it looks black), which is reversed on my feature finger. When the dots were still wet, I used my Picker Upper and put three studs in a few of the bigger dots. I think they look a bit like soap bubbles, hence the title post (haha). To seal the studs, I did two thick coats of Julep's Polymer Top Coat. 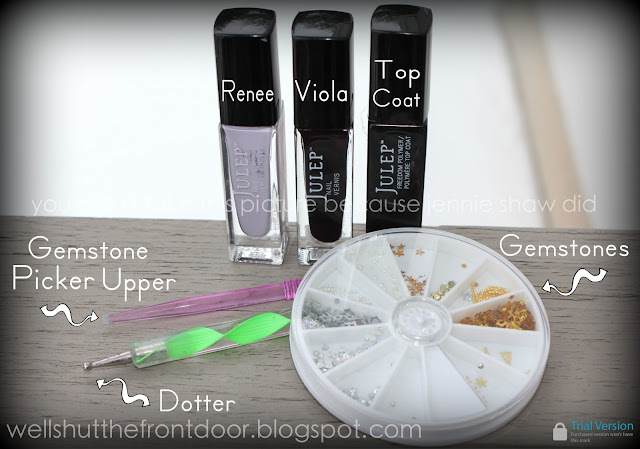 And let's talk about the Polymer Top Coat for a moment, shall we? It's AMAZEBALLS! Yes, there are still smudges, but I find that every top coat smudges a bit. The real difference is that my nails were dry in five minutes. And not just dry to the touch, I mean COMPLETELY dry! It's pricey but when it comes to doing nail art, where there are three or more layers of polish, it's going to be the bottle that I reach for. No more sitting on the couch doing nothing for hours! Oh the time I'll save, Nail Filers...THE TIME! Haha!! Love it :) I tried dots earlier this week - and removed them by the end of the day - they were bad! Could of you of Rocked this Main anymore.. I totally Love it!!! The color combo is awesome.. and Yes I agree this new top coat is totally awesome! you are out of control! looks amazing! I love your nails...every single week! Fabulous!! I had a case of gemstones like that and knocked it over... it was such a #fail but if i ever want to try again then I'll invest in one of those picker up things!